The free to play MMO has somewhat holiday-themed content for your heroes or villains to consume. Update: Sony Online's PR clarified that "Season's Greedings" is absolutely free for all players. The content for DCUO has a bit of a nomenclature that they cleared up for me. All "game updates" - which "Season's Greedings" falls under - are free while "DLC Packs" are free for Legendary players who pay a monthly fee while Free and Premium players would have to purchase them piecemeal. So, you can fight the Orange Lantern Corps without paying a dime, but if you want to use Light or Lightning powers on Agent Orange, you have to pay for the "Fight for the Light" or "Lightning Strikes" DLC respectively. 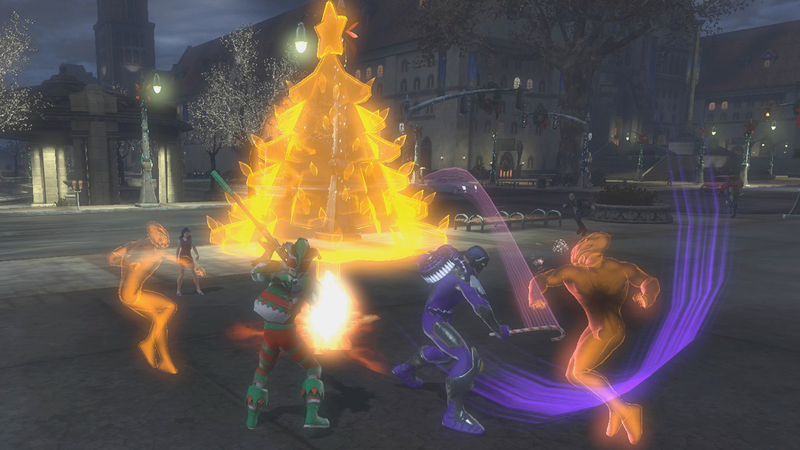 Original: DC Universe Online has had an eventful year. 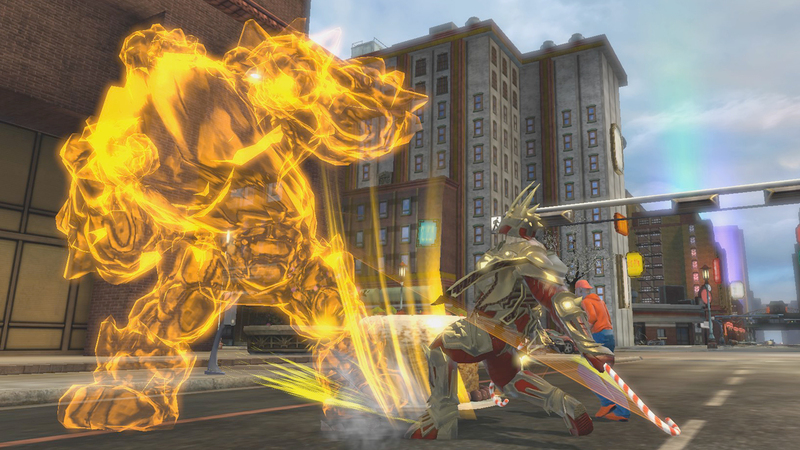 Debuting on both the PC and the PS3 in early 2011, the action-based MMO was fun to play, and boxed sales were high. 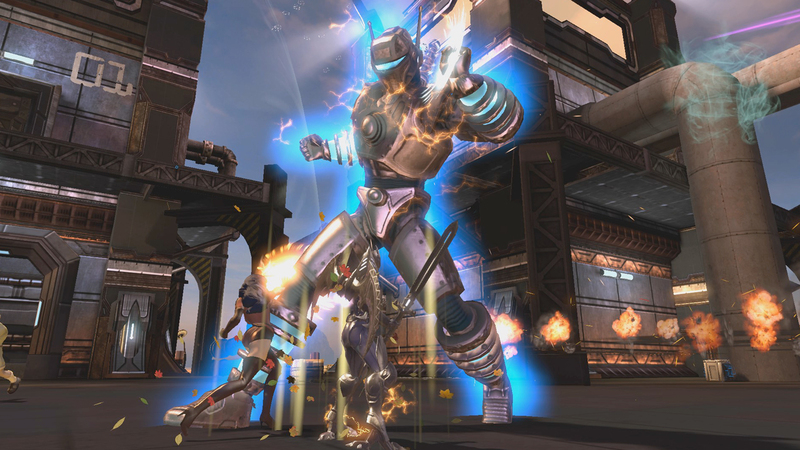 In October though, SOE said DCUO was switching over to a freemium style subscription, with three tiers, and CEO John Smedley tweeted that revenue increased nearly 700 percent. Content has been added to the game fairly steadily, including the addition of force ring power a la the Green Lantern, and this Christmas is no different as SOE announced a pack with a terrible pun for a name - Season's Greedings. Both Gotham and Metropolis are now decorated for the holidays, which is nice. But heroes and villains alike will have to contend with the Orange Lantern Corps and their leader Larfleeze. Like the Green Lanterns embody willpower and the Sinestro Corp use yellow light to bring fear, Larfleeze is known as Agent Orange and he uses the orange light of greed and avarice to steal the identities of people he kills. These poor souls end up as the Orange Lantern Corps, which you'll be able to kill in DCUO, before eventually tackling Agent Orange himself. You know, because he's gone all Grinch on Metropolis, stealing presents from little Timmy. "Being a greedy little guy, it makes sense that Larfleeze wants all of the holiday presents for himself," Sony said. "As the player, it's up to you to track down the stolen presents, battle Larfleeze's deadly orange light constructs." I haven't picked up DCUO in a while, even though I loved the first few levels and the design of Gotham and Metropolis, but creating a Green Lantern hero and taking out Agent Orange might just pull me back in. And hey, it's free, so why not? Although, on second thought, I'm not sure whether "Season's Greedings" is freely available without one of the premium subscriptions. The three-tiered structure means the free players still have to buy DLC, while Premium and Legendary players get it for free. I'll check this tonight, but does anyone know if you have to fork over cash for "Season's Greedings"?